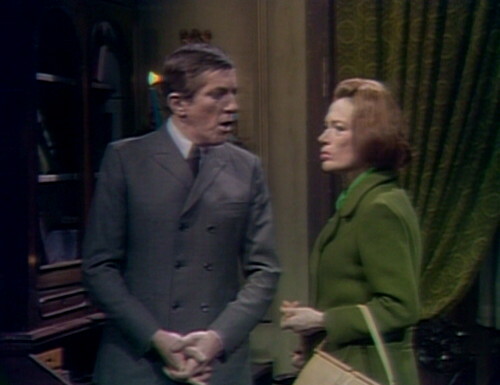 Barnabas and Julia are bickering again. Dr. Woodard’s getting closer to discovering Barnabas’ secret — he’s met the ghost of Sarah Collins, and in yesterday’s episode, he eavesdropped on Barnabas and Julia talking about the notes that she’s been keeping on her experiments. Julia reports that she’s spoken to Woodard, and she didn’t get very far. It’s not, obviously, because this is a soap opera, which doesn’t allow for the end of anything. In fact, the entire episode today is an exercise in time-filling. I talked a couple weeks ago about the show’s new emphasis on crafting exciting cliffhanger endings, especially on Fridays. The downside of that approach is that you can end up with the occasional glacial Thursday. It doesn’t help that today’s episode is written by Ron Sproat, who tends to write in circles, even on the best of days. For example, here’s Barnabas telling Julia that they need to burn her notes. 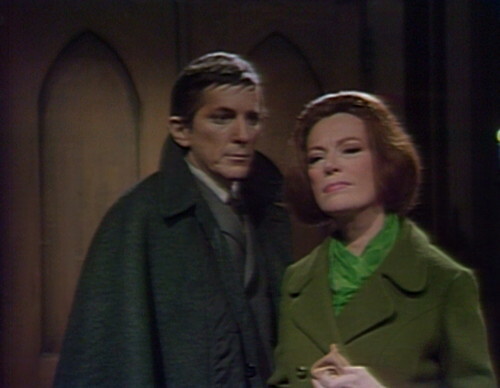 Barnabas: What if Woodard, or anyone else for that matter, finds out about them? Julia: How could anyone find them? They’re under lock and key in my room. No one knows they even exist. Barnabas: Well, someone might find them. Barnabas: Well, I don’t know. But Dr. Woodard is already suspicious. Now, to be completely fair to Sproat, Grayson Hall is clearly having a hard time with her lines in this scene, so it’s possible that’s not exactly the way it was scripted. But I’d like to believe that Sproat got to the line “How?”, couldn’t figure out a good answer, and just kept on typing. 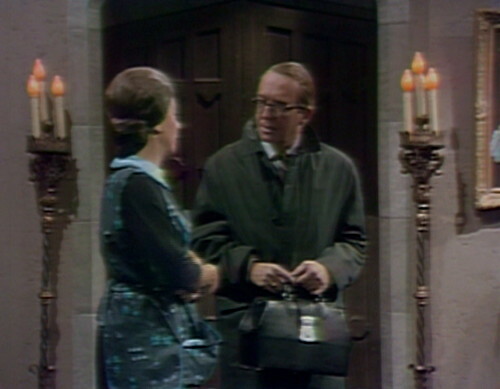 Meanwhile, Dr. Woodard shows up at Collinwood, and tells Mrs. Johnson that he’s there to see David. This is actually his second visit tonight — he talked to David in Tuesday’s episode, and then went over to the Old House. Then he went from the Old House to his office, and now he’s back at Collinwood to see David again. It’s still the same night; he’s apparently coming around for a second lap. But this is one of those extra-long nights that they have in Collinsport; it’s one of their specialties. Every soap opera plays around with time to some extent, because it’s hard to map five half-hours to a week of broadcasting. That’s why people on soaps are always saying “you remember the other day, when…” They can’t be any more specific than that. Soap families usually celebrate Christmas morning together, go and have lunch, and then get dressed for the New Year’s Eve party that night. They don’t do that on Dark Shadows, because Collinsport is a sovereign nation that doesn’t celebrate holidays; there’s just a long drizzly afternoon, followed by two weeks of moonlight. 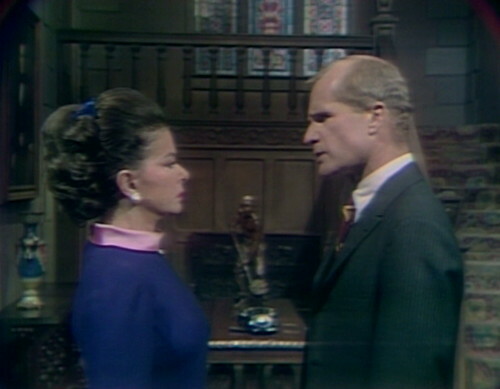 Anyway, then we get a scene of Liz and Roger arguing; it’s a big evening for disagreements. The issue here is that Liz has invited Vicki and Burke to live in Collinwood’s west wing once they’re married, so Vicki can still be close to David during his difficult period. This is a story thread that’s been running through several episodes over the last couple weeks. I haven’t mentioned it, because it’s pretty dull and it doesn’t really go anywhere, but the whole episode today is about killing time, so here it is. But here’s the big excitement; hang on to your seats. Dr. Woodard isn’t really here to see David after all — he just said that to Mrs. Johnson so he could go upstairs to Julia’s room, and rummage around for her notebook. He heard Julia say yesterday that the book is locked in a strongbox, but he doesn’t know where the box is. This will occupy him, and us, for several minutes. Checking back in at the Old House, it looks like Barnabas still wants to burn stuff. Barnabas: Don’t argue with me. Those notes must be burned, now, tonight — before they get into the wrong hands! Barnabas: I said don’t argue with me. We’ll go to Collinwood now, and get them, and burn them. Julia: I wish I could persuade you that it isn’t necessary. Barnabas: Well, you can’t, so don’t bother trying. It’s actually kind of cute. Everybody’s so cranky today. And then there’s a weird bit of extra time-killing. Julia: You’re actually frightened, aren’t you? Barnabas: Well, why shouldn’t I be frightened? If anyone got ahold of the contents of your notebook, I could be exposed and destroyed. Julia: I never thought you were capable of feeling any emotion… even fear… but you are. 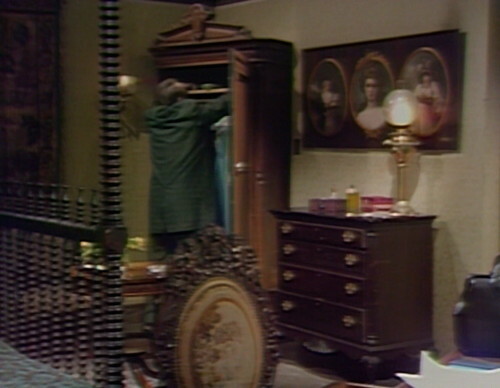 But we’re not done wasting time — next up, there’s another minute of Woodard searching Julia’s room. 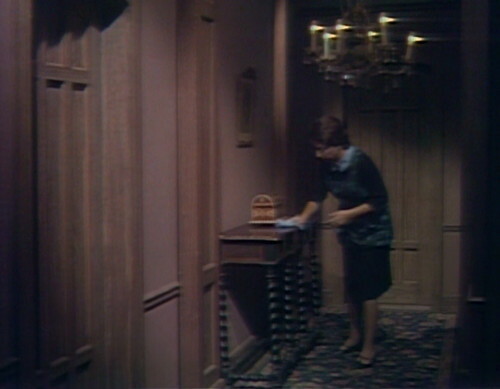 Then we cut to the hall, where Mrs. Johnson is carefully dusting around the Petofi box. Woodard knocks something over, so Mrs. Johnson opens the door to see if somebody’s in the room. Woodard hides behind the door, and Mrs. J says, “Funny… I was sure I heard… Well, I guess I was mistaken.” And she closes the door again. By the way, just to clarify — this is one of my favorite television shows of all time. Not this episode, obviously. But overall. Okay, back downstairs to Roger and Liz. Roger: You’re the one who’s being absurd. So that’s going well; apparently they’ve found some common ground. 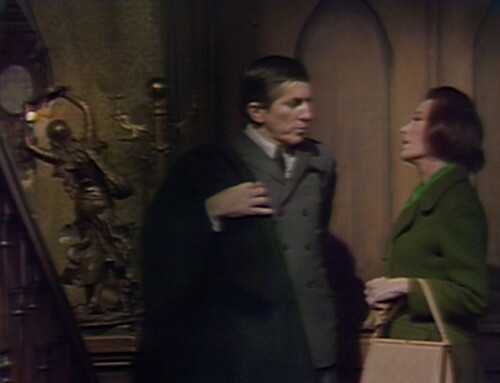 Barnabas and Julia come in, and they say hello to Roger and Liz before heading upstairs for the notebook. But then Roger says, “Barnabas! Before you go…” and now everyone’s talking about Burke and Vicki living in the West Wing. Then it’s back up to Julia’s room, where Woodard is still searching for the notebook. It just goes on like this. 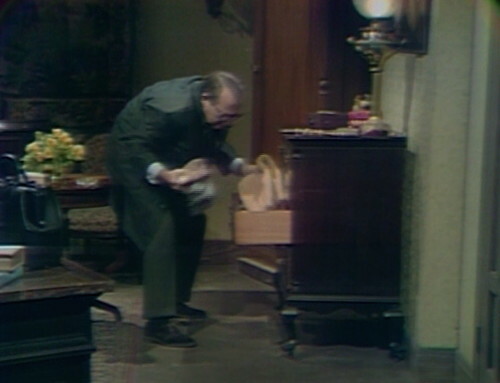 Woodard finally finds the box, and then he goes downstairs and talks to everybody for a minute, and then Barnabas and Julia go upstairs, and there’s more talking, and more searching, and then the next thing you know, it’s Friday. Tomorrow: Dave Woodard Must Die! When Julia walks into the Old House at the beginning of the show, there’s a ton of studio noise. People are walking around, and it sounds like somebody bumps into something. 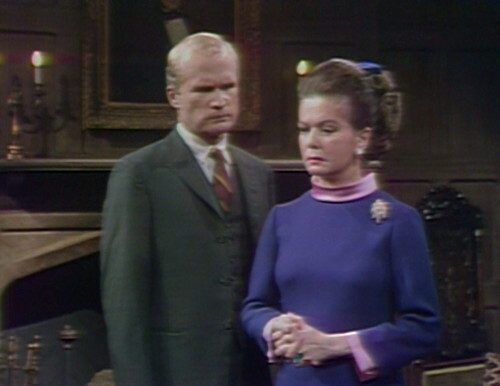 When Roger and Liz are arguing in the Collinwood foyer, Mrs. Johnson misses her cue to come in. 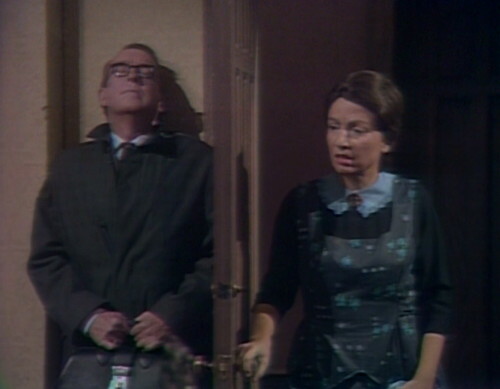 Roger and Liz turn toward the door, before Mrs. Johnson opens it. 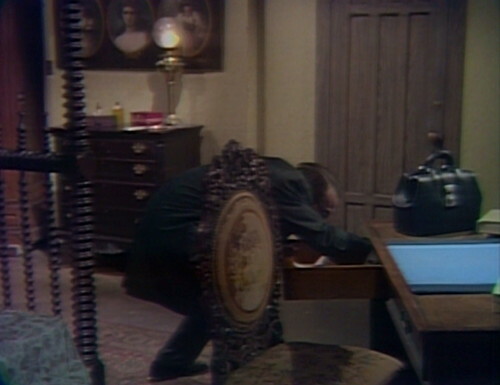 While Roger is asking for Barnabas’ opinion, they cut to a camera that isn’t focused on anything. A minute later, there’s a loud squeak, and then they cut to the wrong camera again. Roger starts talking too early at the start of the final act. When they come back from commercial, Roger is halfway through his line. Barnabas and Julia are on an urgent mission — retrieve her medical notes before Dr. Woodard gets his hands on them! 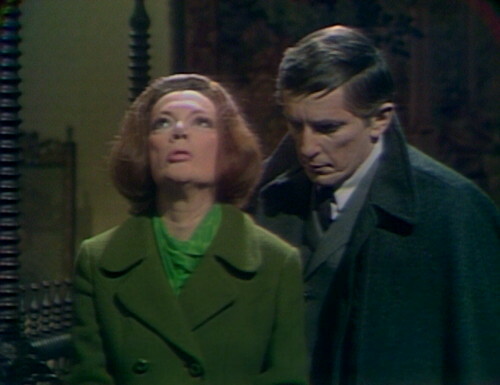 But first, Barnabas is drawn into one of Roger and Liz’s epic quarrels. Yeah, I reckon’ it’s time-wasting, but I loved it. Barnabas clearly was caught in the middle and was so uncomfortable. All his supernatural skills are useless when playing referee between Liz and Roger. 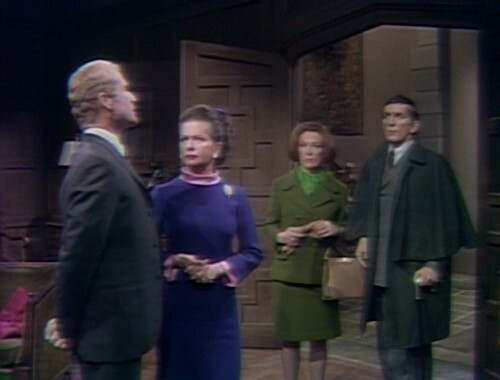 I could have watched a full show of Liz, Roger, Julia and Barnabas down in the drawing room. Good old Roger I always enjoy his presence here , but what a tower of jello. He folds with the slightest, confrontation, no one listens to him or takes his advice, not Liz, not Barnabas, not Burke, not Victoria,not the doctor , not David, no wonder he knocks back so much cognac . Was Mitch Ryan running one of the cameras during this episode. Maybe he was filling in while the strike was going on, seeing as he was unemployed at the time. This probably got ABC to the bargaining table after watching the horrible camera work during this episode. Also why was Julia so confident that no one would be able to get her notes. It certainly couldn’t be due to the security of the “lockbox” she had them in or the clever hiding spot she picked. She would have been better off hiding it under her mattress. If I were Barnabas I’d choke her after discovering her elaborate protective scheme. I wonder why she didn’t store her notes somewhere at the Old House? There would be a million hiding places in a home that large! I, too, wondered why Julia didn’t keep her notes at the Old House, but then I thought the security of the Old House and its basement has been in question for a while now. Better not to keep everything in one place. Not that she had a foolproof hiding place on top of her armoire (sp?). Julia tells Barnabas where her lock box is and he barks “get it.” Julia seems a bit disappointed that Barn wasn’t going to be chivalrous and get it for her. I heard Roger start to say “late sister” but I thought he swallowed “late” – didn’t quite say it. But the fact I knew that that was what he was about to say means he might as well have said it. I thought it odd that Roger remarked on how nervous Barnabas was. OK. It was important that somebody belabor Barnabas’ fright, but it meant that Roger did not comment on the even more obvious nervousness of Dr. Woodard who gave another one of his “I got to be somewhere else immediately” goodbyes. Oh, another thing. I don’t remember if we have seen Julia’s notebook before, but it looks like something in which she would keep her dreams about her future existence with Barnabas once she cures him, rather than scientific notes on her experiments. Each of her graphs must be made with a tiny ruler, take up whole pages, and spill over onto the next several pages. I’m pretty sure what’s going on behind the scenes in this one is, one of the cameras broke down! Starting in the early scenes at the Old House, you get a number of camera shots which start out really wide, or at unusual angles, and then awkwardly zoom in. Then you get the cuts to cameras which aren’t even in position in the drawing-room scene, the weird “shooting flat along the set wall so it looks as stagey as possible” wide-shot in Julia’s room, and the triumphantly awkward “zoom in from a too-wide wide-shot to a CU on Barnabas, then pan to Julia” end to one of the drawing-room scenes. Basically, it looks like the director was winging it, calling whatever shots he could get away with, while the vision mixer chewed his knuckles with fear!